We have had dogs come in and go out quickly before and we have had dogs come in and still be with us to look for a home after years of waiting. Our lad Sparky however was blessed with arriving and finding himself reserved in just 24 hours. By his second day in our care he found himself whizzed off to his new home, initially on a foster basis until we had time to arrange for his neutering. He fitted in nicely with the other dogs in residence and all is well. In Sparky’s case his adopters are already well known to us so there were no delays to him heading home. Sparky is safe and very happy in their care and all should be formalised as an adoption in the not very distant future. The very lucky Sparky who found himself reserved in a very short time. 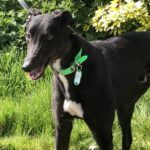 Sparky is a very lucky boy indeed, it would be lovely to see some of our longer stay greyhounds be just as lucky and find their homes before long. Due to Sparky moving out of the kennels so unexpectedly quickly Wallace the greyhound moved in a little quicker than we anticipated. 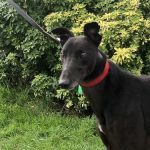 Wallace’s photo and brief details about him can be found, along with information about all our other available greyhounds, in our Greyhound Needing homes Gallery. Wallace, Piper and Lucy are our most recent arrivals. 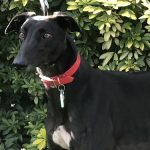 Information about all our available greyhounds can be found in our Greyhounds for Adoption gallery. 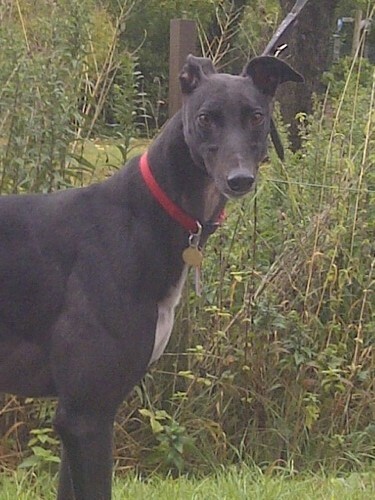 Ryder, Raquel, Poppy (previously Isla) and Tilly have been homed. Minty and Rosa are reserved. Niki and Jet are in foster care. 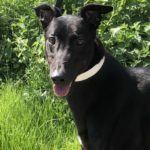 If one of our foster dogs interests you as a potential new family member then you simply need to call us and we’ll arrange a mutually convenient date and time for you to meet him/her. Here’s Niki in the sea. 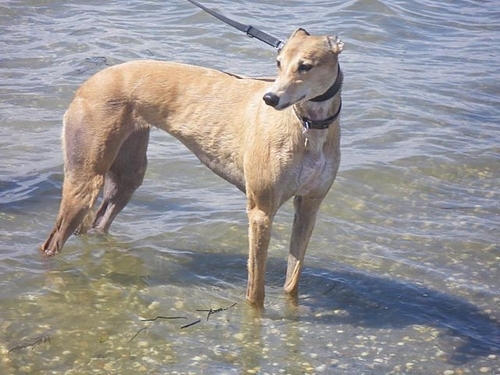 Niki went on holiday with her foster mum recently and throughly enjoyed a real swim in the sea. What Niki would really like though is a home of her own. She’s waited patiently for a whole year now to be chosen. Could she be for you? Please have a look around your home, ask your friends and work colleagues too perhaps to see if there are any unwanted items around. We’d be happy to help re-home them and raise funds to support the greyhounds in our care by doing so. We can collect from the Fleet, Hampshire and the Wokingham area in Berkshire, possibly other areas too by prior arrangement. Alternatively you could bring the items to our kennels between 11am and 1pm daily. We are particularly keen to receive donations of children’s toys and games, toy cars, fishing equipment, war memorabilia, unwanted Christmas themed items, kitchen equipment, costume jewelery, DVD & CD’s (but not video tapes please), dog coats, toys and chews of all sizes and styles and anything else you can think of except clothing that could be saleable. Ideally we are looking for items that can be transported easily by car. If you have larger items and wish to raise funds for us then you can always sell them on ebay (see the “fundraise for us using ebay” section below for more information). We need more foster homes. Ideally we are looking for foster homes within easy traveling distance of Fleet, Wokingham, Alton or Southampton as we have trusted volunteer team members in those areas who would be able to assist with viewings if a trip to the kennels was not possible. We prefer foster carers who have some experience of dog ownership and training. Homes without cats and young children are especially sought because homes with young children and/or cats or inexperience dog handlers severely restrict our options of the greyhounds we could place with you. 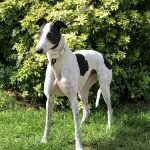 If greyhound fostering is of interest to you, then please visit our fostering information page to see if it could be the route for you. Saturday 21 September 2013 – The Great Greyhound Gathering is being held at Nottingham Racecourse. Full details are available from www.retiredgreyhounds.co.uk. Sunday 22nd September 2013 – Pet Blood Bank arrive for their regular scheduled canine blood donation session at our kennels in Fleet, hampshire. If you have a healthy dog aged 1-8 years old of 25kg or more then please call Pet Blood Bank on 01509 232222 to make an appointment. Your dog’s donation could save up to four other dogs’ lives. Please see our Blood Donation Information page for full details of what is involved. PBB nurses prepare a previous donor and keep him comfortably relaxed. Pet Blood Bank do not take blood from any dog that is stressed by the events going on around them. If you are coming along on the 22nd, don’t forget that we’ll have our usual array of home made goodies to tempt you with. Please be aware of Lungworm, it’s a killer that many of you won’t necessarily have heard of. It is spreading fast in the UK and many dogs have already died from it. Don’t panic however as Lungworm is very easy to prevent and equally if diagnosed early it can be treated very successfully too. Late diagnosis of Lungworm does not always have a happy ending however. The following link will take you to a Lungworm Information site. For preventative treatment of lungworm you will need to contact your vet. Treatment/prevention of Lungworm is by prescription medication only. 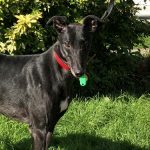 You can now sell items on ebay and choose to donate between 10% and 100% of your sale price to Greyhound Lifeline. If you are an ebay member you could also simply donate by using your Paypal account. For ebay members only please visit their Sell for Charity page and enter “Greyhound Lifeline” in the Charity name area. If you are a UK tax payer please also tick the Gift Aid box. Please read ebay’s terms and conditions carefully as we cannot be held responsible for any problems you may encounter. Could you sell your unwanted items and help us to buy food, provide veterinary care and generally look after the greyhounds in our care at the same time? 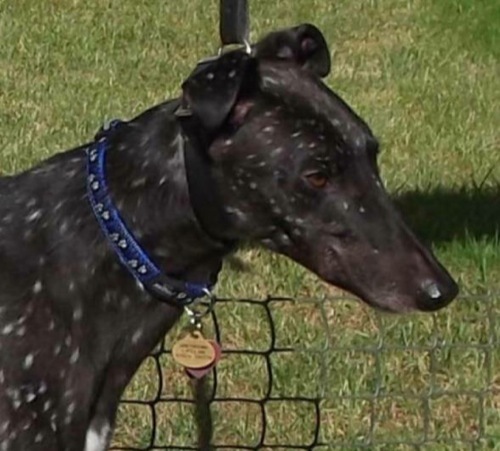 We have a new entry in Penny’s Greyhound Blog, we hope you enjoy reading it. Are you a budding author? If perhaps you are and you’d like to write a blog about all things greyhound then please contact us and ask for Marie who will be happy to talk you through the process. 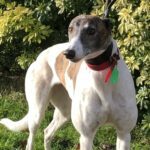 This entry was posted in News and tagged greyhound fostering, greyhound fundraising, greyhound news, new arrivals, Pet Blood Bank by Marie.